The Black-billed Magpie is a fairly common bird of western North America. However, as it prefers open habitats with only clumps of trees, it is somewhat of a rarity in our heavily forested region. As a result, it is a delight to encounter. A magpie flew past carrying a lumpy something in its bill — but what is it? The magpie is an omnivore, so it is just unclear whether its prize is animal or vegetable. 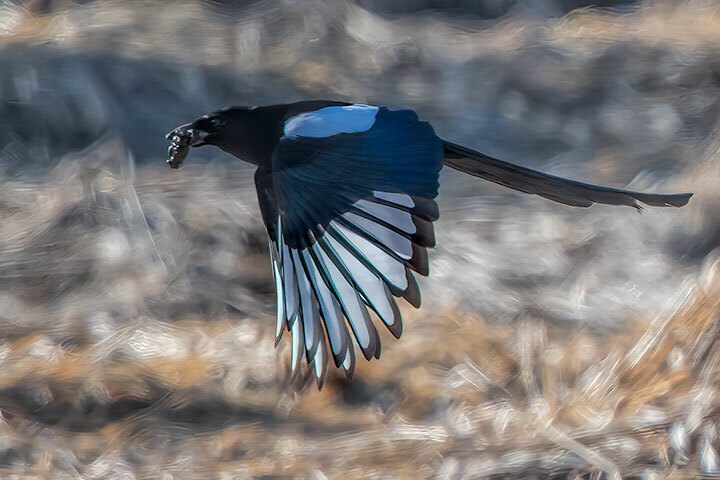 While the magpie’s comestible is indeterminate, one feature is obvious from this side view: the magpie’s unusual tail makes up more than half its body length. Wonderful photo as usual, could it be a ‘grub’ already or is that too early? Another question: I’ve noticed you have a countdown, it’s now at 5, does that mean you’re giving up? I hope not. Countdown? to engender curiosity, not angst. Terrific photo Alistair! I’ve lived in BC since 1981 and have never seen a magpie here. Christine, visit the Harrop Wetlands.